Home to many of the American Southwest’s most iconic places, from the awe-inspiring rock formations of Arches National Park to the mesas, mountains and rivers that carve ribbon-like canyons through the dry rock of Canyonlands National Park, Moab is often thought of as the nation’s outdoor paradise, a mecca for mountain bikers, trail runners and adventure sports enthusiasts of all stripes. 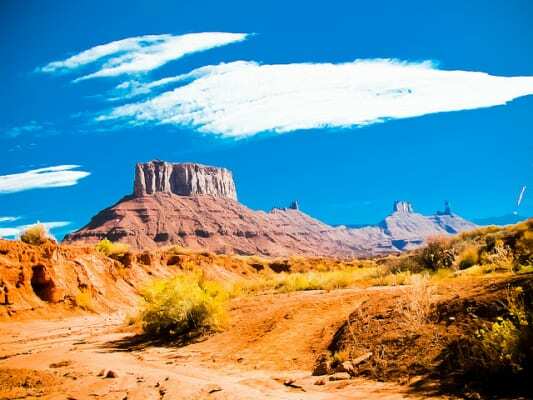 Combine all of that scenery with memories of the classic 1991 movie starring Geena Davis and Susan Sarandon and you get the Thelma & Louise Half Marathon and Relay, a race organized by the race management company that stages the Moab Other Half Marathon and Canyonlands Half Marathon each year. Designed especially for women runners of all ages, the race will also benefit a pair of charitable organizations that support women and girls — Girls on the Run and the Seekhaven Family Crisis Center, a shelter for victims of domestic violence in southeastern Utah. Runners are set to start the race at 6:00 AM Mountain Time at the Gold Bar Campground just outside Moab, along Highway 279. From there, the course follows 279 all the way west and south between Arches and Canyonlands National Parks, toward Dead Horse State Park. The race parallels the Colorado River the entire way, and when runners reach the bend in the river at the half-way point, they make the turn and head back toward Gold Bar Campground for the race finish. From the finish line area runners and their friends and families will get to take in the panoramic views of Arches in the distance during the post-race festivities. The course time limit for the race is 3 hours, 30 minutes, which means runners will need to keep a pace of about 16 minutes per mile or better in order to finish within the official race time. The race is open to women only as participants, but their husbands, sons, uncles, fathers and boyfriends are welcome to volunteer at the aid stations, race start and race finish lines. The Thelma & Louise Half Marathon is a women’s-only race, organizers note, though men are welcome to participate as volunteers, course marshals, at the start/finish line area, or at the race packet pickup. Located along the Colorado River in southeastern Utah, about 100 miles southwest of Grand Junction, Colo., and roughly 230 miles southeast of Salt Lake City, Moab typically sees low rainfall year-round and very little in June, a month that has brought record temperatures here as low as 37 degrees (in 2001) and as high as 113 degrees (in 1936). On race day (June 1), the average low is 55°F and the average high is 91°F. See the race route map for the Thelma & Louise Half Marathon here. To reserve your spot in the late spring/early summer 2019 running of Moab’s Thelma & Louise Half Marathon, register online at UltraSignUp.com here. Ever run in the Thelma & Louise Half Marathon? Share your impressions here, or post your review in the Comments box below. Where does the 10K begin and end?